If you were injured in a crash with a commercial semi-truck in Bedford, you cannot afford to go it alone when fighting with the trucker’s and trucking company’s insurance provider for the compensation you deserve. You need an experienced truck crash attorney in Bedford to protect your legal rights and to ensure that you receive what you are owed. Special federal and state regulations and laws govern truck drivers and trucking companies. 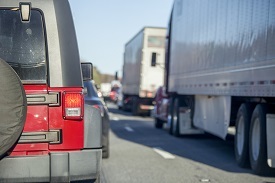 An experienced truck crash attorney will understand these requirements and which violations may have led to your crash. A lawyer who handles these cases will conduct a thorough investigation of your collision. This can include going to the incident scene, interviewing witnesses, collecting photographs, and advising the trucking company of documents that should not be destroyed through a spoliation letter. In addition to the negligent trucker, the trucking company, shipping company, truck manufacturer, maintenance facility, and others could face liability for causing your injuries. You do not have the skill to identify them on your own. In a Bedford truck crash claim, you are entitled to be compensated for your medical expenses, lost wages, and pain and suffering. Your lawyer can value your claim and collect the evidence you need to prove the amount of compensation you should receive. An attorney who handles many truck wreck cases will have a track record of success in successfully settling these claims. He will have strategies to resolve disputes and will aggressively fight for your rights. If the insurance company will not be reasonable, you need an attorney to file a lawsuit before the statute of limitations expires and to litigate your claim. Your lawyer should not be afraid to take your case to trial if this becomes necessary. Do you need to file a claim following a truck accident? Contact us online or call our office today at 817.380.4888 to schedule your free consultation to learn how our Bedford truck wreck attorneys can assist you and about our extensive experience in these cases.